Rathika's Nest: Count Your Blessings ! Gentle drizzle, scent of rain and chill weather greeted the day, which happened to be a Sunday. Naani was sitting on the window sill, watching the rain water drip from the hibiscus leaves. He was feeling hungry and grumpy, after throwing a tantrum over breakfast. Well, Naani was an ordinary seven-year-old boy with a lean frame, bright eyes and dark skin. Being a ‘picky eater’ was the only peculiarity he displayed. Otherwise, he was a lovely, endearing kid. He disliked all fruits, vegetables and several dishes cooked at home! This left him invariably hungry and equally grumpy. Naani got moody often and his food preferences changed drastically. When his mother made ‘idly’ for breakfast he would insist on having ‘dosa’. But when she served ‘dosa’, he would demand something else. He became very irritable whenever his stomach was empty. Unable to bear his tantrums, at times his mother would yield to his demands, by letting him eat biscuits and chocolates, which he enjoyed immensely! Naani’s father Raman was very strict and in his presence, Naani quietly ate the food. However, he knew that he can get away easily with his mother. Naani woke up late this morning and had a cup of milk. His mother had made ‘idly’ for breakfast, which he did not feel like eating and pushed the plate away. Naani threw a tantrum; left the breakfast untouched and settled down on the window sill. A nice, well tended garden surrounded Naani’s house, and from his station he could see the hibiscus bush, jasmine creeper and several rose plants, beyond which there was an open shed meant for washing vessels and clothes. A garbage bin sat outside the shed and Naani could see the apple he had thrown out the previous evening after taking single bite. Presently their maid Kalpa was washing vessels in the shed and her daughter Manju was sulking in a corner. Manju was a five-year-old kid with dirty unkempt hair, large brown eyes and slightly upturned nose. She was wearing a filthy frayed frock in somewhat dark colour. “Keep quiet Manju... You can eat as soon as Radhamma gives me breakfast...” admonished Kalpa. Radha gave a cup of coffee and breakfast to Kalpa every morning. Kalpa finished washing the vessels and went through the backdoor to bring the clothes out. Naani was watching Manju with an idle curiosity. Suddenly Manju's eyes brightened and she moved swiftly towards the garbage bin. Naani craned his neck to see what she was doing. 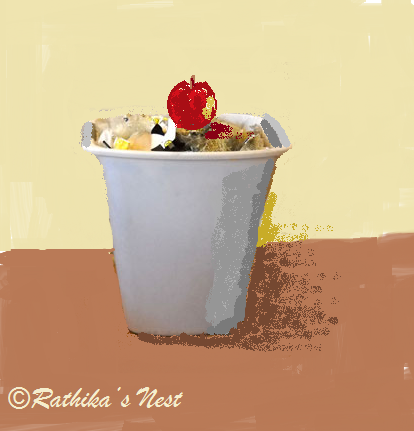 Manju picked the apple from garbage bin with a sly look on her face and walked across the shed to the tap. She looked around cautiously, washed the apple in running water and then started to eat the fruit with relish. Naani, who was watching the whole drama with disbelief, jumped off the window sill and ran to inform his mother. He found Radha handing over the breakfast tray and coffee mug to Kalpa in the kitchen. By the time he reached there, Kalpa was already walking towards the back door, picking up a bucket of clothes on the way. Naani dragged Radha to the window only to find Manju throwing the core away after eating the apple. Radha listened to Naani’s account patiently. “She ate the apple from the garbage bin... Isn’t it wrong? ” Naani asked anxiously. “Yes, it is... You should not pick things from the garbage... I will talk to Kalpa...If the child is hungry she should have asked me for food... “ Radha was lost in thought for a moment, and then continued. Corporation school was on the way to his convent and Naani had watched children carrying plates, standing in a queue to receive their free meal. He nodded and Radha continued softly. “Don’t they love their children?” Naani was bewildered.